The UFC boss Dana White has confirmed that he met Floyd Mayweather's team in Los Angeles to talk about a fight deal with Khabib Nurmagomedov. Floyd Mayweather&apos;s team has already met with the UFC boss Dana White regarding a fight with Khabib Nurmagomedov. White refuses to entertain a boxing rules contest between his lightweight champion Nurmagomedov, and Mayweather. This is because he already sent one of his best athletes to the ring last year, when Mayweather coasted to a 10th round stoppage win over Conor McGregor in August 2017. White now wants to bring Mayweather to the UFC but did begrudgingly admit that there is only one man who could change his mind — Nurmagomedov. And Nurmagomedov has come up with a cunning plan, a two-fight deal which would see one bout using boxing rules and the other using mixed martial arts rules. Floyd Mayweather&apos;s representative has met with the UFC boss Dana White to discuss a fight with the company&apos;s lightweight champion Khabib Nurmagomedov, and it could involve a groundbreaking two-fight deal. Nurmagomedov&apos;s stock in combat sports has never been higher after he stunned the Irish striker Conor McGregor with a fourth round submission at UFC 229 on October 6. Since then, a crossover bout between Nurmagomedov and the retired American boxer Mayweather has been headline news as both athletes have spoken positively about a deal. "I had a meeting yesterday in Los Angeles about this," White told ESPN on Thursday. "I don’t want to say anything that’s going to make it sound like &apos;wow this could happen&apos; but we had talks yesterday." The meeting follows Mayweather&apos;s statement last month that he is absolutely fighting Nurmagomedov. But the former five-weight world champion boxer had one stipulation — the bout had to be fought using boxing rules. This did not appear to perturb Nurmagomedov, who met with the Russian Boxing Federation in October. He even posted a statement on Instagram claiming the fight could attract 100,000 spectators to the Luzhniki Stadium in Moscow, and generate "a world record for the sale of paid broadcasts." But a boxing rules contest is something White refuses to entertain. White has already sent one of his athletes to the boxing ring for a fight against Mayweather, when McGregor lost a 10th round stoppage in 2017. Because of this, he only wants to bring Mayweather into the UFC, for a fight using mixed martial arts rules. 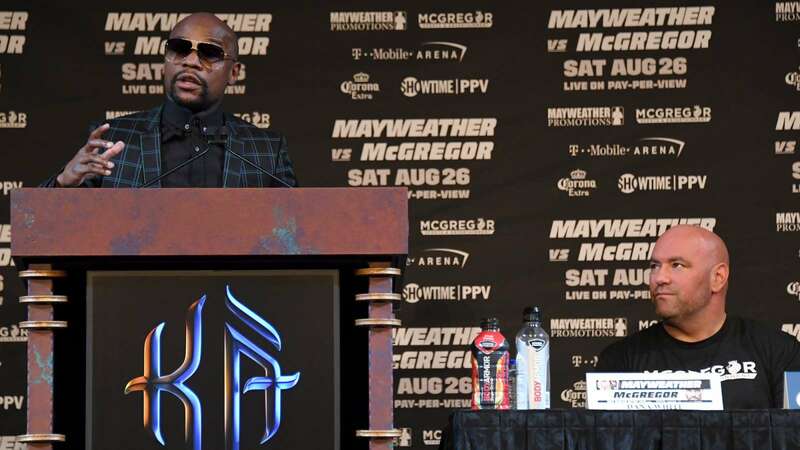 White said earlier in the week that if Mayweather wanted to fight, he had to fight a "real fight" — a real fight meaning a UFC bout, not one where combatants were not permitted to kick, wrestle, or choke each other. "I don’t think it’s going to happen," he said to ESPN. "I don’t think the fight would happen in the UFC but they didn’t say no." He added: "We went over there, we boxed him and if he wants to do it again, he’s gotta come fight in the UFC. I don’t think it’s very realistic at all, but the boxing match happened… so we’ll see." White said there would be "no boxing match" but said his mind could be changed by Nurmagomedov, providing it was something the Russian wrestler really wanted. "Obviously if it was something that Khabib really wanted to do, we’d sit down and talk about it but I don’t like anything about it. I haven’t talked to Khabib about it at all. His interest needs to be defending his title over here. That’s what he should be focused on." But Nurmagomedov is not focused on defending his UFC title. As previously mentioned, he has already discussed a boxing rules fight in Russia, and he reportedly told beIN Sports earlier in the week that one way an agreement with Mayweather could be struck, is if they negotiate a groundbreaking two-fight deal — one using boxing rules, and another in the UFC. "If we make a bilateral agreement with Floyd Mayweather, the fans will be pleased," he said, according to talkSPORT. "The first match in the ring and the second in the cage, then this would be real," he said. "I want to test myself in boxing once, that’s fair."